Honor Martin Luther King Jr., savor soul food and celebrate the rich heritage and culture of Oklahoma’s African American population at one of these annual events. 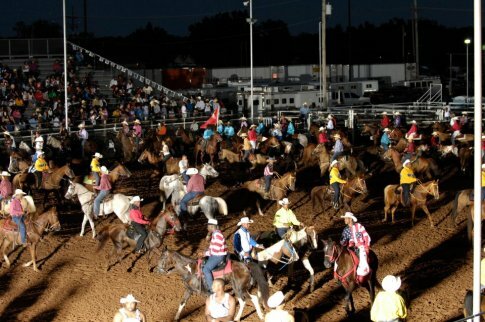 The Okmulgee Invitational Rodeo is the nation's oldest African American rodeo. Oklahoma was once home to the largest number of black towns in the nation. Here, you’ll discover a rich history that blends cultural resilience, Western heritage and a dash of good, old-fashioned soul food. Experience heart-stopping action at the nation's oldest African American rodeo, pay homage to the great Martin Luther King Jr. at a downtown parade or taste soul food recipes that have been passed down for generations at one of the following featured events. Boley, Oklahoma, was once described by Booker T. Washington as the finest black town in the world. Today, this small community in central Oklahoma is home to just over a thousand people, although that number rises dramatically on the last weekend in May during the Boley Rodeo & BBQ Festival. This heritage festival has been a staple since the town’s founding in 1903, a full four years before Oklahoma gained statehood. In addition to mouthwatering barbecue, this two-day event also includes exciting rodeo events, an afternoon parade and plenty of family friendly entertainment. Come celebrate the historical significance of this traditionally all-black town, which was the largest predominately black town in America during the early twentieth century. Homemade macaroni and cheese, sweet potato pie and pork roasts are some of the delectable fare you’ll find at the Martin Luther King Jr. Soul Food Cook-Off in Muskogee. Held annually on the Saturday before Martin Luther King Jr. Day in January, this event showcases the best recipes from local cooks. Visitors will get a fill of collard greens, black-eyed peas and hot water cornbread, all while learning about the origin of soul food. Between 1865 and 1915, Oklahoma was home to the largest number of all-black towns in the nation. Today, residents of the remaining towns open their arms to visitors during the All-Black Towns Bus Tour. The tour, which departs from Tulsa on a Saturday in June, takes visitors on an all-day trip to several of the state’s current and former black towns. Aboard the bus, guests will be entertained by a local historian as they make their way to the next town. Once they arrive at their destination, guests will get to meet with current residents to learn the town’s history and what part it played in shaping Oklahoma. Advance reservations are required. Celebrate freedom and honor the legendary civil rights leader at the Martin Luther King Jr. Parade in Tulsa. Held annually on MLK Jr. Day, this event grows larger each year. The Tulsa parade, which features a variety of floats as well as live music, is one of the largest Martin Luther King Jr. parades in the United States. A new theme is featured each year. Walk in the footsteps of famous lawman Bass Reeves, the first African American to be commissioned as a U.S. Deputy Marshal west of the Mississippi River, at the annual Bass Reeves Legacy Lawmen & Outlaw Tour in Muskogee. Held during the town’s Heritage Days celebration each September, this tour will teach visitors about the Deputy Marshall-turned-Muskogee policeman Bass Reeves. Along the way, you’ll walk the same “beat” that Bass Reeves patrolled and meet costumed interpreters portraying different characters from Bass Reeves’ era. Watch out, because you just might stumble into a mock gunfight! The Cowboys of Color Rodeo in Oklahoma City showcases 200 cowboys and cowgirls during the first Saturday each May. Both educating and entertaining, this rodeo showcases the cultural contributions that all races have made to keep the traditions and history of the West alive. You’ll pay for the whole seat, but will only need the edge during exciting bull riding, calf roping, steer wrestling, bronc busting and barrel racing events. In Tulsa, visit the Green Country Cowboys of Color Rodeo, which is held in late August. Not only is the Okmulgee Invitational Rodeo the nation's oldest African American rodeo, but it’s also one of the state's longest running rodeos as well as one of the largest African American sporting events in the nation. Held annually since 1956, this rodeo has grown into a full-blown festival complete with a parade, vendor booths and tasty fair food. Save the date for the second weekend in August and experience the Okmulgee Invitational Rodeo for yourself.